In a two-part article published 15 and 23July2016 by Olga Verbiana of Rohatyn in Газета Голос Опілля (The Voice of Opillia), a Ukrainian newspaper of the Rohatyn-Berezhany-Pidhaitsi region, it was reported that a large number Jewish headstone fragments were recently uncovered during street work on vul. Drahomanova southwest of the town center. Rohatyn retired school teacher Mikhailo Vorobets, our ally and partner in town, provided the details of the recovery; the article was then brought to our attention through Facebook by another resident of Rohatyn, Svitlana Roskosh. A sample of the various headstone fragments recently unearthed from vul. Drahomanova and Zavoda. Photos © 2016 Olga Verbiana. We contacted Olga and learned that headstones were found not only at vul. Drahomanova but also under vul. Zavoda, across the Hnyla Lypa river. We visited both areas with Mr. Vorobets during our May 2016 visit to Rohatyn, and both have yielded Jewish headstone fragments in past years. Mr. Vorobets anticipates that they will continue to yield matzevot as utilities, roads and pavements are upgraded by the city in the next years. Another sample of the various headstone fragments recently unearthed from vul. Drahomanova and Zavoda. The red granite matzevah. Photo © 2016 Olga Verbiana. Given the red granite material of the stone and the 1935 date of her death, we guess the woman was buried at Rohatyn’s new Jewish cemetery which had opened in the 1920s. Today there are several similar large red granite headstones still in situ at that cemetery, located at the north end of town. More headstone fragments recently unearthed from vul. Drahomanova and Zavoda. 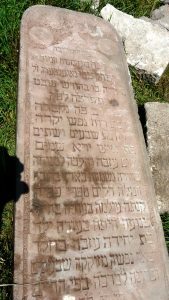 Olga sent us 24 excellent photographs of the matzevot, now all recovered to the old Jewish cemetery in keeping with the plan proposed by Rabbi Kolesnik of Ivano-Frankivsk; we will aim to take additional photographs documenting the stones on our next visit to Rohatyn, on 06 September. We are grateful to Olga, Svitlana, Mr. Vorobets, the Rohatyn city staff, and local citizens for recovering these stones and for alerting us to their discovery. Several views of the recently recovered matzevot now at home in Rohatyn’s old Jewish cemetery. Past news reports on this site have described other recovery work on vul. Drahomanova and vul. Zavoda, in May 2016, April 2013, and May 2011. To read more about this lead project in our Rohatyn Jewish Heritage program, see the Jewish Headstone Recovery Project page. Update 30Jul2016: An excellent article about the recovery of these headstones and our project in Rohatyn was published today in the online regional newspaper Газета Вікна (Window); the article quotes extensively from our news report, and includes the outstanding photos by Olga Verbiana. We are very happy to see such great coverage of this Jewish heritage project in Rohatyn.